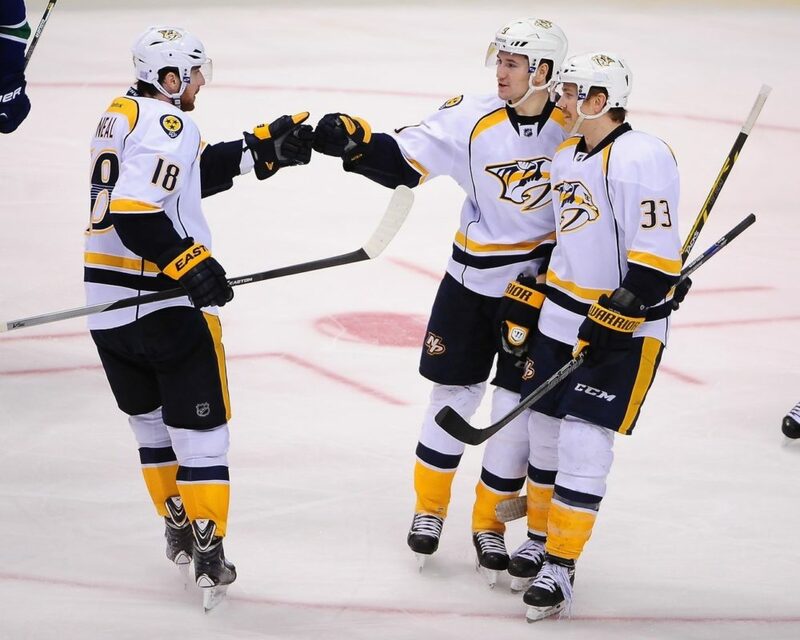 Preds Poll: Can James Neal Bounce Back? The bookends to James Neal’s début season with the Nashville Predators were fantastic. Neal started his season with a hat trick as he provided all three goals in Nashville’s 3-2 win over the eventual Stanley Cup champion Chicago Blackhawks. He ended the season strong with four goals in the Predators first-round series against the Blackhawks. However, Neal’s début season in the Music City was a bit of a disappointment. Neal scored 23 goals, but that was a far cry from his prodigious offensive numbers when he was with the Pittsburgh Penguins, when he would consistently put up 30-40 goal seasons. Those offensive numbers are discouraging to a player that is making $5 million according to our friends at CapFriendly.com, The question is whether or not he can bounce back in 2015-16. There was excitement when the deal sending Neal to Nashville in exchange for Patric Hornqvist and Nick Spaling was announced. The club hasn’t been known for having many bonafide scorers, and Neal filled that need. The Predators hadn’t seen a goal scorer with Neal’s resumé since Paul Kariya was with the team in 2007. Neal’s hat trick against the Blackhawks looked like a sign that Neal would finally be the top-line sniper that Nashville needed. It was the only three-goal game in the regular season by a Predator. He’d start out as one of the league’s hottest scorers as he notched seven markers in the opening month of October. Neal also had a flair for the dramatic as he had six game-winners and 13 of his 23 goals came in the third period or overtime. His goal against the Washington Capitals in Barry Trotz’s first game back at Bridgestone Arena capped a very emotional night in which the Preds proved they could hang with the National Hockey League’s big boys. Bit by the Injury Bug? However, Neal’s blistering start would cool off as he’d have to deal with various injury issues, including a stint on the injured reserve in a January for a lower-body injury. He missed games later in the year in March after dealing with a nagging upper-body injury. That latter injury also may have caused him to score only one goal in March and April. The injury wasn’t specified, but it did hinder him. He also struggled in the month of November with just two scores. One of the reasons besides the injuries may have been that he was no longer with former Hart Trophy winner Evgeni Malkin, who makes many of his teammates look good. Our own Colin Fitts pointed this out earlier in the summer. The reason he put up those career high numbers was because he was playing alongside Malkin, whom won the Hart Trophy that year after tallying 50 goals and 59 assists, most of the season. Neal lived and died by Malkin. As Neal’s time in Pittsburgh continued for another two seasons, it became clear he was not the same player without Malkin. Per game in Pittsburgh playing without Malkin, Neal averaged three shots, 0.24 goals and 0.63 points less. After one year with a new team, Neal has proven he needs Malkin. Neal was often paired up on the first line with the crafty and rejuvenated Mike Ribeiro and dynamic rookie Filip Forsberg. Ribeiro and Forsberg are solid players, but they’re not the dynamic playmakers that Malkin is. He did reach a career-high 40 goals in the 2011-12 after he was partnered with the Russian center. Neal has flourished when he’s got great players with him. However, Ribeiro has proven to be a great passer, while Forsberg has proven the same. Neal was also put on the second line a few times with Mike Fisher and interchanged with wingers like Craig Smith and Colin Wilson. He’s hoping to find a groove and some stability with a set of linemates. Predators fans are usually happy with 23 goals from one player, but Neal wants to do better for a team that has a chance to make some noise this season. However, he did score four times in six games against Chicago, including two in the Game 6 season finale. That encouraging end might be a harbinger of good things for Nashville and fantasy hockey fans. They are hoping that is a sign that Neal will return to being the real deal. What do you think? Vote in the poll and leave comments below. How many goals will James Neal score in 2015-16? Dan Mount is a Nashville Predators staff writer for The Hockey Writers. You can follow him on Twitter, @DanMountSports. He can be contacted at drm7191980@yahoo.com.